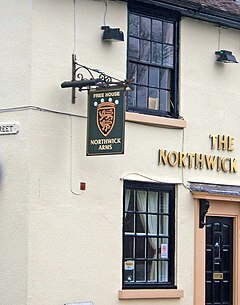 The Northwick Arms pub sign, Northwick, Worcester. This is the sign of the Northwick Arms public house, on the corner of Vine Street and Northwick Road. It is a free house serving this part of the north Worcester suburb of Northwick. Northwick is a district of Worcester, England, located in the north of the city on the left (east) bank of the River Severn. Historically, Northwick was a manor in the parish of Claines, and in the Middle Ages the manor house was a residence of the Bishops of Worcester. Currently in Northwick, two notable buildings/business are Northwick Manor Primary School and Worcester Lawn Tennis Club. ^ Victoria County History of Worcestershire: Claines, British History, English Heritage, UK.